I may not be the world’s greatest living expert on beauty products, but I have a face, and I’ve been putting cream on it daily for I’d say 30 years. My moisturiser story goes like this. Super cheap (and great) brands like Simple through my teens and 20s, occasionally dabbling in a more expensive treat or gift. Graduating to something a bit more hardworking in my 30s, often a reliable French brand like Clarins or Avene. And then in my 40s, this little number has slid straight into my daily routine. I do appreciate a PROPER face cream now, nothing lighthearted. For my skin to be noticeably softer, my moisturiser needs to have a thick consistency and staying power. 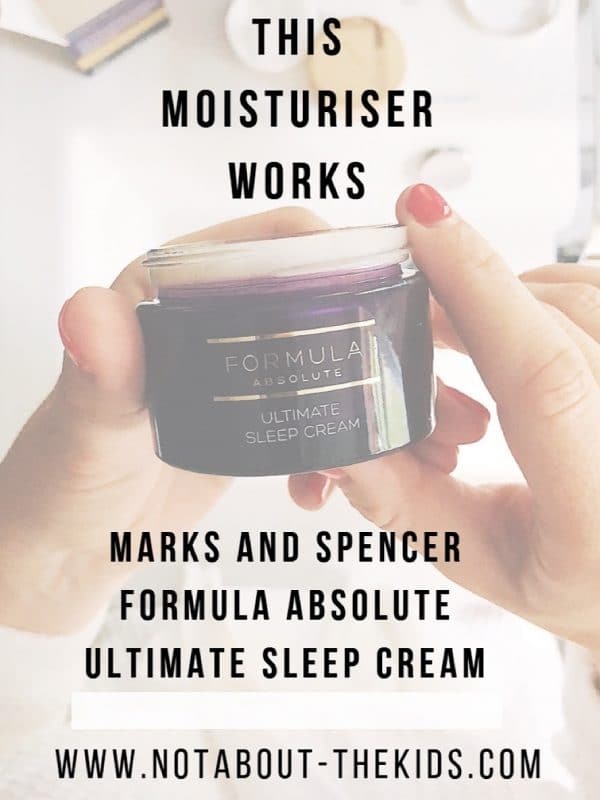 M&S Formula Absolute Ultimate Sleep Cream hit the shelves a few years ago and almost instantly became a superstar sell-out product. It was a while before I heard about it (it was recommended numerous time on social media and in real life), and I wasn’t in the habit of bothering with a separate night cream. I don’t really believe in having lots of different creams for different jobs. At the time when I decided to try ‘Sleep Cream, I was experimenting with beauty reviews on my Instagram account. Stock levels were so low that I had to order my it online. Now, it always seems to be available at my local M&S. At £22 it comes in a decent price point but looks nice enough to give as a present. 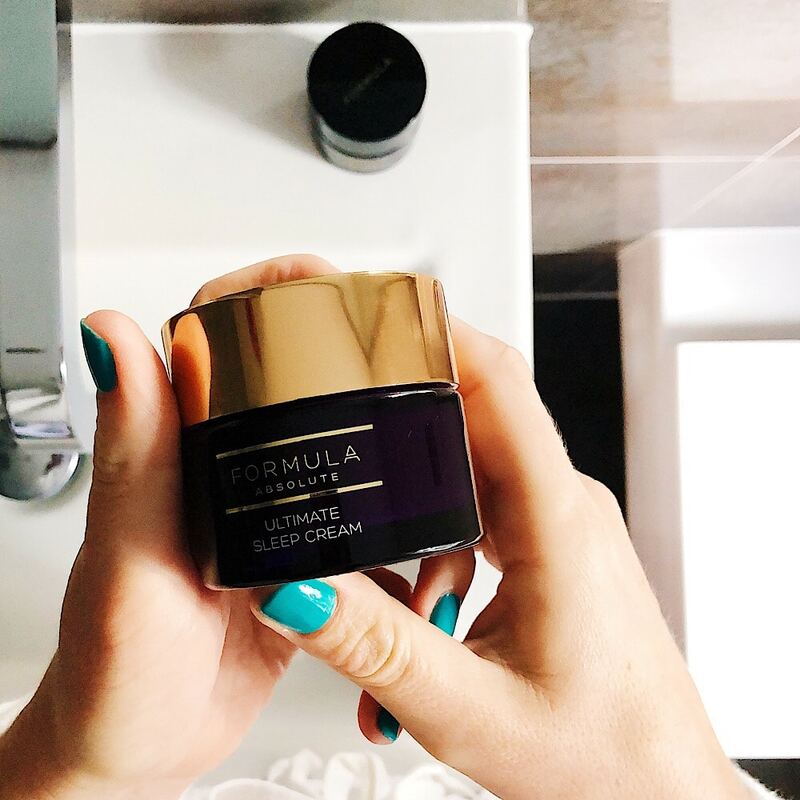 It is as simple as this; Ultimate Sleep Cream smells nice, has a great texture, and makes my skin feel noticeably smoother and less tight. I’ve since invested in the All In One Cream from the Formula Absolute range, which I use after a shower in the morning. It’s equally nice, but if I don’t have it I quite often wear Sleep Cream during the day too. It’s the real star of the line, and the one I would recommend without hesitation. On this occasion, my Sleep Cream was a gift from Marks and Spencer Beauty PR. I was under no obligation to review it. Read my policy on gifted content. And here’s where you can find out more about me and Not About The Kids. Click this image to share this post to Pinterest (and let’s follow each other there too).